The goal is to completely automate the brake press to bend a variety of different parts. 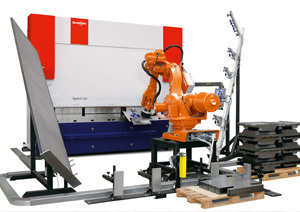 Contributed by | Midwest Engineering Systems Inc.
Midwest Engineering Systems Inc. (MWES) provided a Robotic Brake Press Tending System to automate the metal part bending process of a Bystronics Brake Press for a metal fabricator. The goal is to completely automate the brake press to bend a variety of different parts. Must be capable of handling as many different parts as possible. Some parts need to be bent in more than one location. Ability to automatically change tooling. Part weights were upwards of 500+ lbs. Our customer provides product to the automotive and military industries and must maintain high quality standards on shipped finished goods as well as throughout the manufacturing process. During the proposal stage, MWES performed a thorough evaluation of the current situation to provide a solution option. In order to achieve all of the project’s goals, multiple solution options were analyzed before a final path was chosen. 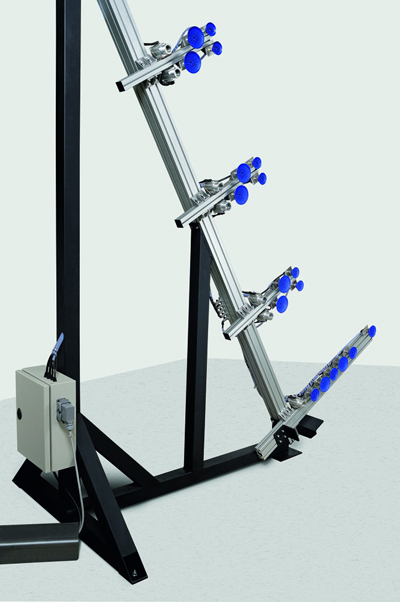 Implemented robot safety equipment, which meets ANSI/RIA standards for robot cell safety. Electrical & Mechanical Installation and on-site operator training at customer facility. About Midwest Engineering Systems Inc.